Manson said that his motive for Smells Like Children was in essence to make a children's album for adults, evoking imagery of the 1970's of his generation and dually portraying certain characters which have much more sinister connotations than simply children's story protagonists. Very similar in a sense how Grimm's fairytales are children's favourites but often have incredibly dark, evil and cannibalistic themes. 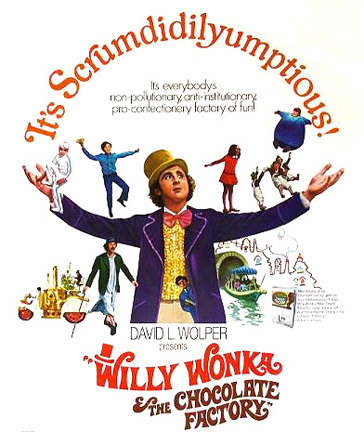 Willy Wonka is one such character that Manson was particularly fascinated with throughout Portrait Of An American Family and Smells Like Children, Wonka being certainly child's ideal playmate but one who can also be viewed as a pied piper with a dark ulterior motive behind his colorful outward persona. Examples of Manson evoking Wonka are numerous, from the Dope Hat video being a surreal and nightmare version of the Chocolate Factory to lyrical references and samples (many of which were removed due to copyright licensing issues on the proper release) to Manson stylizing the 'Marilyn Manson' logo as a parody of Willy Wonka's signature font and logo. Marilyn Manson logo appearing on stickers and other merchandise circa 1993 / 1994 stylized after a Lynyrd Skynyrd skull & crossbones logo.